How can humans have an impact on bacteria? We learned in Module 3: Soils that each human is comprised of more bacterial cells than human cells… truly amazing! Does human activity have the ability to change the population within one of us? Can we affect the bacteria that circulate in our environment? There are several ways in which human activity can influence bacteria, both directly and indirectly. Check Your Thinking: Direct impact occurs by our use of antibiotics in humans and in agricultural feed. To understand how, we need to remember that bacterial populations can reach exceedingly large numbers of cells: ten million per milliliter is not unusual. If an antibiotic kills 99.99% of these cells, how many remain? Hint (0.0001)x(10,000,000)=?? Figure 9.12: There are major health consequences that result from the introduction of antibiotics to the environment. 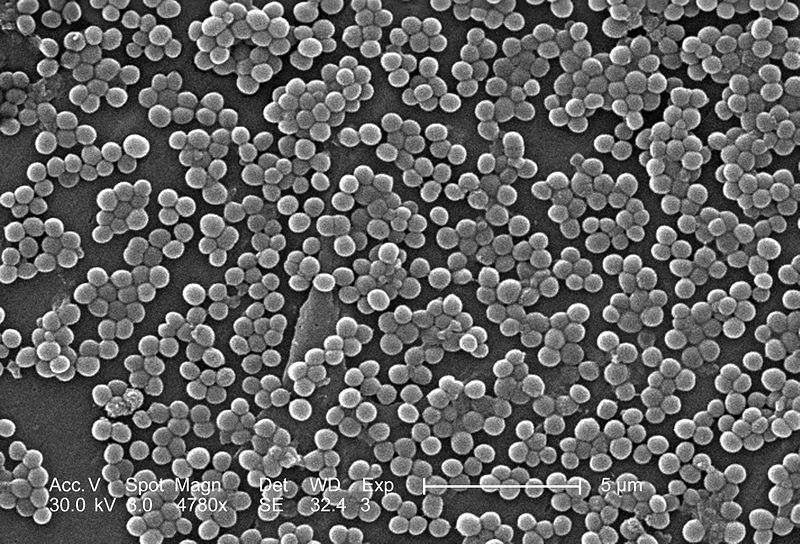 For example, in the US, antibiotic-resistant Staphylococcus (MRSA), pictured above, kills more people than AIDS each year. Those remaining cells are able to live even with the antibiotic present. If they divide 14 times (maybe in 7 hours!) they are back to about the ten million, and now all these cells can live in the presence of the antibiotic. If their happy human host sneezes on a neighboring human, the bacteria breathed in by host #2 will be antibiotic resistant! You can see how antibiotic resistance can result from human selection of resistant bacteria. This is why doctors and pharmacists tell patients to take ALL the prescribed antibiotics, not to stop when symptoms subside. Many bacteria have mechanisms to transfer DNA from one cell to another, known as conjugation, or to pick up DNA from the environment, known as natural competency. The genes for resistance to antibiotics can be acquired in nature by these and other mechanisms; therefore antibiotic resistance can spread from one bacterial species to another. 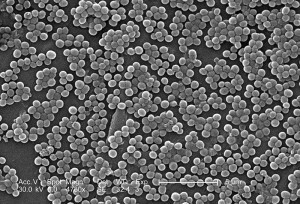 Pathogenic species of bacteria can acquire multiple resistances, making them virtually untreatable by conventional drugs. Indirectly, humans can impact the environment, including oceans, fresh water, air, and soil, by farming and industrial activities. Addition of chemicals to the environment can remove helpful bacteria, making “room” for harmful species. Some metals can make soil essentially uninhabitable for many species required by plants, making the soil infertile for farming purposes. Antibiotics used in animal feed often end up in the animals, as well as in the soil and water, and promote the evolution of antibiotic-resistant bacteria. Finally, as the planet’s temperature increases with increased carbon dioxide emissions from automotive and industrial exhaust, microbes will be able to thrive in new environments while being excluded from formerly habitable areas. Weather and temperature will influence the bacterial populations in the oceans and soils, and result in an economic impact on agriculture and fisheries. Because humans share the earth’s ecosystem and an impact on the microbes has effects on every level of the food chain, health and economy are linked to planetary ecology. To discuss human impacts on bacteria, visit the Forum: Impacts on Bacteria, or leave a comment below to get feedback from the MSP team.